This article is about the city in Sri Lanka. For the administrative district enclosing it, see Anuradhapura District. For the ancient kingdom it was capital of, see Anuradhapura Kingdom. Anuradhapura (Sinhalese : අනුරාධපුරය; Tamil : அனுராதபுர) is a major city in Sri Lanka. It is the capital city of North Central Province, Sri Lanka and the capital of Anuradhapura District. Anuradhapura is one of the ancient capitals of Sri Lanka, famous for its well-preserved ruins of an ancient Sri Lankan civilization. It was the third capital of the kingdom of Rajarata, following the kingdoms of Tambapanni and Upatissa Nuwara. The city, now a World Heritage site, was the centre of Theravada Buddhism for many centuries. The city lies 205 km (127 mi) north of the current capital of Colombo in the North Central Province, on the banks of the historic Malvathu River. It is one of the oldest continuously inhabited cities in the world and one of the eight World Heritage Sites of Sri Lanka. Theravāda is the most ancient branch of extant Buddhism today, and the one that preserved their version of the teachings of Gautama Buddha in the Pāli Canon. The Pāli Canon is the only complete Buddhist canon which survives in a classical Indian language, Pāli, which serves as both sacred language and lingua franca of Theravāda Buddhism. For more than a millennium, Theravāda has focused on preserving the dhamma as preserved in its texts, and it tends to be very conservative with regard to matters of doctrine and monastic discipline. Since the 19th century, meditation practice has been re-introduced, and has become popular with a lay audience, both in traditional Theravada countries and in the west. It is believed that from the fourth century BCE until the beginning of the 11th century CE it was the capital of the Sinhalese. During this period it remained one of the most stable and durable centres of political power and urban life in South Asia. The ancient city, considered sacred to the Buddhist world, is today surrounded by monasteries covering an area of over 16 square miles (41 km2). Vihara generally refers to a monastery for Buddhist renunciates. The concept is ancient and in early Sanskrit and Pali texts, it meant any arrangement of space or facilities for pleasure and entertainment. The term evolved into an architectural concept wherein it refers to living quarters for monks with an open shared space or courtyard, particularly in Buddhism. The term is also found in Ajivika, Hindu and Jain monastic literature, usually referring to temporary refuge for wandering monks or nuns during the annual Indian monsoons. In modern Jainism, the monks continue to wander from town to town except during the rainy season (Chaturmas), the term "vihara" refers their wanderings. Although according to historical records the city was founded in the 5th century BC, the archaeological data put the date as far back as the 10th century BC. Very little evidence was available about the period before the 5th century BC (i.e. the protohistoric period), though excavations have revealed information about the earlier inhabitants of the city. Further excavations in Anuradhapura have uncovered information about the existence of a protohistoric habitation of humans in the citadel. The protohistoric Iron Age, which spans from 900 to 600 BC, marked the appearance of iron technology, pottery, the horse, domestic cattle and paddy cultivation. In the time period 700 to 600 BC, the settlement in Anuradhapura had grown over an area of at least 50 hectares (120 acres). The city was strategically situated of major ports northwest and northeast. It was surrounded by irrigable and fertile land. The city was also buried deep in the jungle providing natural defence from invaders. The Iron Age is the final epoch of the three-age system, preceded by the Stone Age (Neolithic) and the Bronze Age. It is an archaeological era in the prehistory and protohistory of Europe and the Ancient Near East, and by analogy also used of other parts of the Old World. The three-age system was introduced in the first half of the 19th century for the archaeology of Europe in particular, and by the later 19th century expanded to the archaeology of the Ancient Near East. Its name harks back to the mythological "Ages of Man" of Hesiod. As an archaeological era it was first introduced for Scandinavia by Christian Jürgensen Thomsen in the 1830s. By the 1860s, it was embraced as a useful division of the "earliest history of mankind" in general and began to be applied in Assyriology. The development of the now-conventional periodization in the archaeology of the Ancient Near East was developed in the 1920s to 1930s. As its name suggests, Iron Age technology is characterized by the production of tools and weaponry by ferrous metallurgy (ironworking), more specifically from carbon steel. The Lower Early Historic period, spanning from 500 to 250 BC, is studied on the lines of the chronicles. During this time King Pandukabhaya formally planned the city, with gates, quarters for traders etc. The city at the time would have covered an area of 1 square kilometre, which would have made it one of the largest in the continent at the time. It is believed that King Pandukabhaya made it his capital in the 4th century BC, and that he also laid out the town and its suburbs according to a well-organized plan. He constructed a reservoir named Abhayavapi. He established shrines for yakkhas such as Kalawela and Cittaraja. He housed the Yaksini-Cetiya in the form of a mare within the royal precincts, and offerings were made to all these demi-gods every year. He chose the sites for the cemetery and for the place of execution, the Chapel of the Western Queen, the Pacchimarajini, the Vessavana Banyan Tree, the Palm of the Vyadhadeva, the Yona Quarter and the House of the Great Sacrifice. The slaves or Candalas were assigned their duties, and a village was set apart for them. They build dwellings for Niganthas, for wandering ascetics and for Ajivakas and Brahmanas. He established, the village boundaries. The tradition that King Pandukabhaya made Anuradhapura the capital city of Sri Lanka as early as the 4th century BC had been very important. The administrative and sanitary arrangements made for the city and the shrines he provided indicate that over the years, the city developed according to an original master plan. His son, Mutasiva, succeeded to the throne. During his reign of sixty years, he maintained Anuradhapura as his capital and further laid out the Mahameghavahana Garden which was to play an important role in the early history of Buddhism in Sri Lanka. It was in the period of his successor, his son Devanampiya Tissa, that Buddhism was first introduced to this island 236 years after the passing away of the Buddha. Emperor Ashoka of India was a contemporary of Devanampiya Tissa. Mahinda was the son of Emperor Ashoka of India. Ashoka embraced Buddhism after he was inspired by a very small monk named Nigrodha. The king, who was in great misery after seeing the loss of life caused by his waging wars to expand his empire, was struck by the peaceful countenance of such a young monk. Meeting this young monk made a turning point in his life and he thereafter, renounced wars. He was determined to spread the message of peace, to neutralize the effects from the damages caused by him through his warfare. As a result, both his son and daughter were ordained as Buddha disciples, and became enlightened as Arahats. In his quest to spread the message of peace instead of war, he sent his son Mahinda, to the island of Lanka, which was also known as “Sinhalé”. According to Dipavamsa and Mahavamsa, Thera Mahinda came to Sri Lanka from India on the full moon day of the month of Poson (June) and met King Devanampiyatissa and the people, and preached the doctrine. Historically this period is believed to extend from 250 to 210 BC. This is the point at which a kingship began and a civilization developed based on one of the most significant religions of South Asia, Buddhism. With the introduction of Buddhism, the city gained more prominence and the great building era began. The Mahavansa states that King Kutakannatissa built the first city wall to a height of seven cubits with a moat in front of the wall. This fortification was further enlarged by raising the wall a further 11 cubits to 18 cubits by King Vasabha. The king also added fortified gatehouses at the entrances of which the ruins can be seen to date. The Mahavamsa also states that soothsayers and architects were consulted in the construction. The architectural remains can still be seen and gives a glimpse of what had been the country at that time.Abayagiri Stupa or the Abayagiri Dageba was constructed in 1 Century BC by King Vattagamini Abaya. The Abayagiri complex covers an area of 200 hectares. The height of the stupa is 235 feet and has a diameter of 310 feet at the base of the dome. It is built on a stone paved platform.The techniques used in Anuradhapura era is outstanding. The city's popularity grew both as a ritual centre and as the administrative centre, a large population was attracted to the city for permanent settlement. Thus the living facilities were improved to accommodate the expanding population. King Vasabha constructed many ponds which were fed by a network of subterranean channels which were constructed to supply water to the city. The Tissa and Abhayavapi tanks were built, the Nuwara weva was built and the Malwatu Oya was dammed to build the Nachchaduwa wewa which was 4,408 acres (17.84 km2) in size. Parks were also provided in the city. The Ranmasu Uyana below the bund of Tissavapi or Tissa weva was one such, but it was strictly reserved for the members of the royal family. Health care and education were two other aspects to which the authorities paid attention. There were several hospitals in the city. In the 4th century King Upatissa II provided quarters and homes for the crippled and the blind. King Buddhadasa (337-365 AD), himself a doctor of great repute, appointed a physician to be in charge of every ten villages. For the maintenance of these doctors, one tenth of the income from the fields was set apart. He also set up refuges for the sick in every village. Doctors were also appointed to look after the animals. Kassapa V (914-923 AD) founded a hospital close to the southern gate of Anuradhapura. General Sena in the 10th century is believed to have built a hospital close to the ceremonial street (Managala Veediya). The history of medical care began early, for in the 4th century BC King Pandukhabaya, in the course of sanitizing the town constructed a hospital. A large workforce was entrusted with the task of keeping the city clean. Large lakes were also constructed by the city's rulers to irrigate paddy lands and also to supply water to the city. Nuwara wewa and Tissa wewa are among the best known lakes in the city. Anuradhapura attained its highest magnificence about the commencement of the common era. The city had some of the most complex irrigation systems of the ancient world, situated in the dry zone of the country the administration built many tanks to irrigate the land. Most of these tanks still survive. The ruins consist of three classes of buildings, dagobas , monastic buildings, and pokunas. The dagobas are bell-shaped masses of masonry, varying from a few feet to over 1100 ft (340 m) in circumference. Some of them contain enough masonry to build a town for twenty-five thousand inhabitants. Remains of the monastic buildings are to be found in every direction in the shape of raised stone platforms, foundations and stone pillars. The most famous is the Brazen Palace erected by King Dutugamunu about 164 BC. The pokunas are bathing-tanks or tanks for the supply of drinking water, which are scattered everywhere through the jungle. The city also contains a sacred Bo-Tree, which is said to date back to the year 245 BC. Abhayagiriya Monastery with Samadhi Statue, Kuttam Pokuna (twin pond) and moonstone. Anuradhapura is served by railway and highways. The Northern railway line connects Anuradhapura with Colombo, Jaffna, and Kankesanthurai. Anuradhapura railway station is the city's rail gateway, with major services, such as the Yal Devi, stopping there. Anuradhapura is a central city in Sri Lanka. It is directly connected by road to a large number of major cities and towns on the island. By road, it is connected to Vavuniya, Dambulla, Matale, Puttalam, Trincomalee, Jaffna, Kurunegala and Kandy. Tissa, later Devanampiya Tissa was one of the earliest kings of Sri Lanka based at the ancient capital of Anuradhapura from 307 BC to 267 BC. His reign was notable for the arrival of Buddhism in Sri Lanka under the aegis of the Mauryan Emperor Ashoka. The primary source for his reign is the Mahavamsa, which in turn is based on the more ancient Dipavamsa. Gajabahu I, also known as Gajabahuka Gamani was a Sinhalese king of Rajarata in Sri Lanka. He is renowned for his religious benefactions, extensive involvement in south Indian politics, and for possibly introducing the cult of the goddess Pattini to Sri Lanka. The primary source for his reign is the Mahavamsa, though he is also the only early Sri Lankan king to be extensively mentioned in the Chera Cilappatikaram. Thuparamaya is an ancient Buddhist temple in Anuradhapura, Sri Lanka. Located in the sacred area of Mahamewna park, the Thuparamaya Stupa is the earliest Dagoba to be constructed in the island, dating back to the reign of King Devanampiya Tissa. The temple has been formally recognised by the Government as an archaeological site in Sri Lanka. Abhayagiri Vihāra was a major monastery site of Mahayana, Theravada and Vajrayana Buddhism that was situated in Anuradhapura, Sri Lanka. It is one of the most extensive ruins in the world and one of the most sacred Buddhist pilgrimage cities in the nation. Historically it was a great monastic centre as well as a royal capital, with magnificent monasteries rising to many stories, roofed with gilt bronze or tiles of burnt clay glazed in brilliant colors. To the north of the city, encircled by great walls and containing elaborate bathing ponds, carved balustrades and moonstones, stood "Abhayagiri", one of seventeen such religious units in Anuradhapura and the largest of its five major viharas. One of the focal points of the complex is an ancient stupa, the Abhayagiri Dagaba. Surrounding the humped dagaba, Abhayagiri Vihara was a seat of the Northern Monastery, or Uttara Vihara and the original custodian of the Tooth relic in the island. The Mirisaweti Stupa is situated in the ancient city of Anuradhapura, Sri Lanka. King Dutugamunu built the Mirisaveti Stupa after defeating King Elara. After placing the Buddha relics in the sceptre, he had gone to Tissa Wewa for a bath leaving the sceptre. After the bath he returned to the place where the sceptre was placed, and it is said that it could not be moved. The stupa was built in the place where the sceptre stood. It is also said that he remembered that he partook a chilly curry without offering it to the sangha. In order to punish himself he built the Mirisavetiya Dagaba. The extent of this land is about 50 acres. Although the king Kasyapa I and Kasyapa V renovated this, from time to time it was dilapidated. Isurumuniya is a Buddhist temple situated near to the Tissa Wewa in Anuradhapura, Sri Lanka. There are four carvings of special interest in this Vihara. They are the Isurumuniya Lovers, Elephant Pond and The Royal Family. Atamasthana (අටමස්ථානය) or Eight sacred places are a series of locations in Sri Lanka where the Buddha had visited during his three visits to the country. The sacred places are known as Jaya Sri Maha Bodhiya, Ruwanwelisaya, Thuparamaya, Lovamahapaya, Abhayagiri Dagaba, Jetavanarama, Mirisaveti Stupa and Lankarama. They are situated in Anuradhapura, the capital of the ancient Anuradhapura Kingdom. The Tissamaharama Raja Maha Vihara is an ancient Buddhist temple in Tissamaharama, Southern Province of Sri Lanka. It was one of the four major Buddhist monasteries established in Sri Lanka, after the arrival of Arhant Mahinda Thera to the country. The site of the Tissamaharama Raja Maha Vihara was consecrated by Lord Buddha himself, who spent some time in meditation there with 500 arhats, during his third visit to the island. Tissamaharama monastery had been recognized as a pre-eminent Buddhist educational center of the southern Sri Lanka from the 3rd century B.C. to the 11th century A.D. The Tissamaharama Dagoba which is situated in the premises of the monastery is one of the largest stupas in Sri Lanka. The present chief incumbent of Tissamaharama Raja Maha Vihara is Ven. Devalegama Dhammasena Nayaka Thera. The ancient Sinhalese excelled in the construction of tanks (Wevas) or reservoirs, dagobas and palaces in Sri Lanka, as evident from the ruins which displays a rich variety of architectural forms. Stupas, also called dagobas and cetiyas, are considered an outstanding type of architectural creation of ancient Sri Lanka. Under the influence of Buddhism, there were several changes in the field of architecture in Sri Lanka. The stupa commands a prominent place among these changes. The Stupa is also known by synonymous names such as Chaithya, Dagaba, Thupa, Seya and Vehera. Stupas designed and constructed in Sri Lanka are the largest brick structures known to the pre-modern world. Pandukabhaya was King of Upatissa Nuwara and the first monarch of the Anuradhapura Kingdom and 6th over all of the island of Sri Lanka since the arrival of the Vijaya, he reigned from 437 BC to 367 BC. According to many historians and philosophers, he is the first truly Sri Lankan king since the Vijayan invasion, and also the king who ended the conflict between the Sinhala clan and local community, reorganizing the population. His story is one wrapped in myth and legend. Mutasiva was ruler of the Kingdom of Anuradhapura in Sri Lanka, based at the ancient capital of Anuradhapura. He ruled from 367 BC to 307 BC. He had nine sons, some of whom were his successors such Devanampiya Tissa, Uttiya, Mahasiva and Asela. Mutasiva was the son of King Pandukabhaya. The Anuradhapura Kingdom, named for its capital city, was the first established kingdom in ancient Sri Lanka and Sinhalese people. Founded by King Pandukabhaya in 377 BC, the kingdom's authority extended throughout the country, although several independent areas emerged from time to time, which grew more numerous towards the end of the kingdom. Nonetheless, the king of Anuradhapura was seen as the supreme ruler of the country throughout the Anuradhapura period. Buddhism played a strong role in the Anuradhapura period, influencing its culture, laws, and methods of governance. Society and culture were revolutionized when the faith was introduced during the reign of King Devanampiya Tissa; this cultural change was further strengthened by the arrival of the Tooth Relic of the Buddha in Sri Lanka and the patronage extended by her rulers. Valagamba, also known as Wattagamani Abhaya and Valagambahu, was a king of the Anuradhapura Kingdom of Sri Lanka. Five months after becoming king, he was overthrown by a rebellion and an invasion from South India, but regained the throne by defeating the invaders fourteen years later. He is also known for the construction of the Abhayagiri Dagaba. Abhayavapi or commonly Abhaya Wewa is a reservoir built by King Pandukabhaya who ruled in Anuradhapura from 437 BC to 367 BC, after constructing the city. This is now popularly known as Basawakkulama tank which is not the original name. Tissa Wewa, an artificial reservoir, was built by Devanampiya Tissa in order to increase the water supply to his capital city of Anuradhapura. Only Panda Wewa and Abhaya Wewa are older. The embankment of Tissa Wewa is 2 miles (3.2 km) long and 25 feet (7.6 m) high. Ranmasu Uyana is a park in Sri Lanka containing the ancient Magul Uyana. It is situated close to Isurumuni Vihara and Tissawewa in the ancient sacred city of Anuradhapura, Sri Lanka. It sits on approximately 40 acres (16 ha), and is a noted example of Sri Lankan garden architecture of the pre-Christian era. According to an inscription found in Vessagiriya, the water to the park was supplied by Tessa Wewa and then released to rice fields around Isurumuni Vihara. 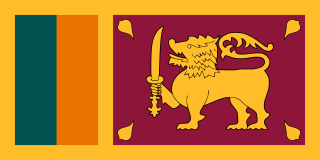 The Sinhalese monarchy has its origins in the settlement of North Indian Indo-Aryan immigrants to the island of Sri Lanka. The Landing of Vijay as described in the traditional chronicles of the island, the Dipavamsa, Mahavamsa and Culavamsa, and later chronicles, recount the date of the establishment of the first Sinhala Kingdom in 543 BC when Prince Vijaya, an Indian Prince, and 700 of his followers landed on the island of Sri Lanka and established the Kingdom of Tambapanni. In Sinhalese mythology, Prince Vijaya and followers are told to be the progenitors of the Sinhalese people. However according to the story in the Divyavadana, the immigrants were probably not led by a scion of a royal house in India, as told in the romantic legend, but rather may have been groups of adventurous and pioneering merchants exploring new lands. The Pre Anuradhapura period or the Early kingdoms period of Sri Lankan history begins with the gradual onset of historical records in the final centuries of the prehistoric period and ending in 377 BC. According to the Mahavamsa, the original inhabitants of Sri Lanka are the Yakshas and northern Naga tribes. Sinhalese history traditionally starts in 543 BC at the arrival of Prince Vijaya, a semi-legendary king who was banished from the Indian subcontinent with his 700 followers, and is recorded in the Mahavamsa chronicle. This period was succeeded by the Anuradhapura period. ↑ Buddhaghosa. (1999). The path of purification : Visuddhimagga. Ñāṇamoli, Bhikkhu, -1960. (1st BPE Pariyatti ed.). Seattle, WA: BPE Pariyatti Editions. ISBN 1928706002. OCLC 44927676. ↑ Birmingham Museum of Art (2010). Birmingham Museum of Art : guide to the collection. [Birmingham, Ala]: Birmingham Museum of Art. p. 57. ISBN 978-1-904832-77-5. ↑ Robert Knox (1681), Historical Relation chapter 2, full quote "There are besides these already mentioned, several other ruinous places that do still retain the name of Cities, where Kings have Reigned, tho now little Foot steps remaining of them. At the North end of this Kings Dominions is one of these Ruinous Cities, called Anurodgburro, where they say Ninety Kings have Reigned, the Spirits of whom they hold now to be Saints in Glory, having merited it by making Pagoda’s and Stone Pillars and Images to the honour of their Gods, whereof there are many yet remaining: which the Chingulayes count very meritorious to worship, and the next way to Heaven. Near by is a River, by which we came when we made our escape: all along which is abundance of hewed stones, some long for Pillars, some broad for paving. Over this River there have been three Stone Bridges built upon Stone Pillars, but now are fallen down; and the Countrey all desolate without Inhabitants. At this City of Anurodgburro is a Watch kept, beyond which are no more people that yield obedience to the King of Candy. This place is above Ninety miles to the Northward of the City of Candy. In these Northern Parts there are no Hills, nor but two or three Springs of running water, so that their Corn ripeneth with the help of Rain." ↑ John Davy (1821), An Account, full quote: "Anooradapoora, so long the capital of Ceylon, is now a small mean village, in the midst of a desert. A large tank, numerous stone pillars, two or three immense tumuli, (probably old dagobahs,) are its principal remains. It is still considered a sacred spot; and is a place of pilgrimage. This information was collected partly from the natives, and partly from an officer who visited it during the rebellion." ↑ Department of Archaeology - Sri Lanka: "The first methodical excavation of the Department of Archaeology had been carried out by Mr. S.M. Burrows in Anuradhapura and Polonnaruwa during 1884 to 1886. Subsequently, the exploration and excavation activities were undertaken mainly in Anuradhapura and Sigiriya with the guidance of Mr. H.C.P. Bell in 1890. Similarly archaeological excavations in Anuradhapura and other areas of the island were carried out under the supervision of Mr. E.M. Ayrton (1912-1914) and Mr. Raja De Silva (1983). Mr. E.M. Hocart who was appointed as the Commissioner of Archaeology in Sri Lanka in 1926, carried out excavations using the method of stratification, in places such as Mathota, Pomparippu, Anuradhapura inner city and Ambalantota." Harischandra, B. W.: The Sacred City of Anuradhapura, Reprint. New Delhi, Asian Educational Services, 1998. R. A. E. Coningham. : The Origins of the Brahmi Script Reconsidered: The New Evidence from Anuradhapura, Minerva 8(2): 27-31, 1995. R. A. E. Coningham. : Anuradhapura Citadel Archaeological Project: Preliminary Results of a Season of Geophysical Survey. South Asian Studies 10: 179-188, 1994. A. Seneviratne. : Ancient Anuradhapura The Monastic City, Archaeological Department of Sri Lanka. p. 310, 1994. S. M. Burrows, The Buried Cities of Ceylon - A Guide Book to Anuradhapura and Polonaruwa Reprint, p. 120, 1999. Wikimedia Commons has media related to Anuradhapura . Wikivoyage has a travel guide for Anuradhapura . Wikisource has the text of the 1911 Encyclopædia Britannica article Anuradhapura .